There's been speculation here about the anonymous "Family Member" (Anon8252) who was in Star City Radio's chat on Wednesday night. 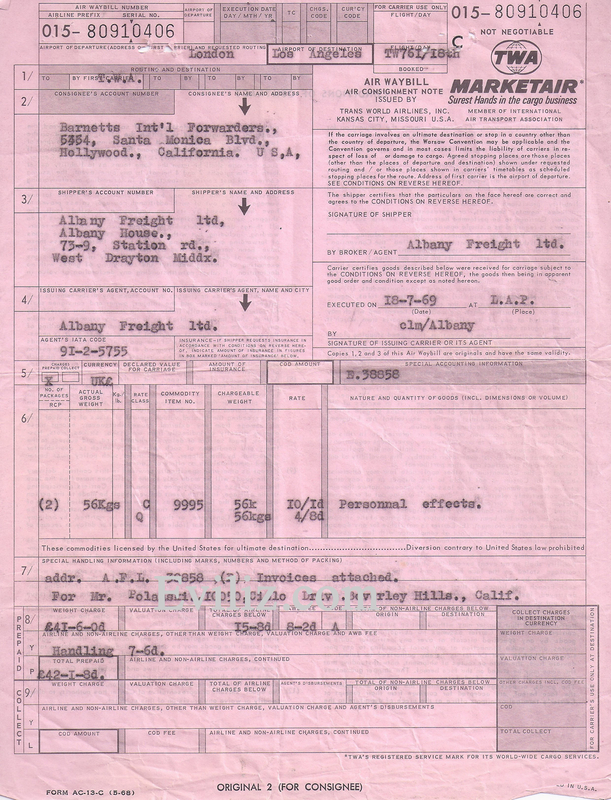 Setting aside the obvious problem with the dates and having details on Kasabian who she could not have met if she left Spahn for good on May 20, 1969 (Linda didn't arrive until later) we'd like to address the part about Sharon's steamer trunks shipped from Europe being full of MDA. We do believe that drugs played a part in the Cielo murders. Do we think that there were drugs in the 2 steamer trunks? We would say that with a 95% certainty that there were no drugs in Sharon's trunks. It makes absolutely no sense. 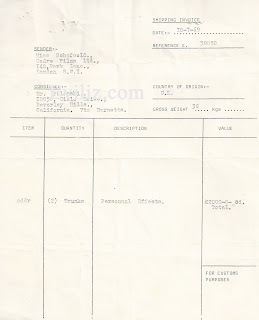 Below is the paperwork for the "drug" trunks. 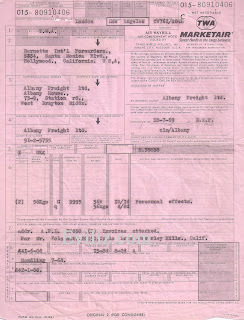 Notice that they were shipped on July 17, 1969 and then didn't arrive in LA until August 8. 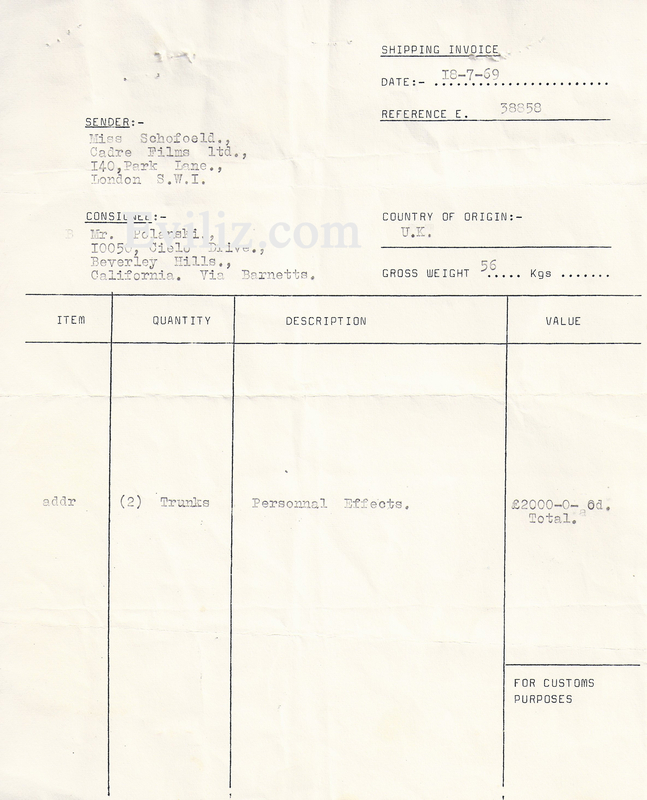 It seems to us that there would be more of a rush to get these "drug filled" trunks to LA. You would have a very hard time convincing us that Roman Polanski, at the height of his directing career - fresh off winning Academy awards for Rosemary's Baby and just signing the biggest deal of his career to direct 3 films for a huge amount of money (at the time) would risk it all to ship drugs in a trunk that is so easily traced not only FROM him (albeit his secretary at Cadre) but TO him at his current address in the US. Also, in these types of trunks there is no hidden compartment or even a lining in these trunks to hide drugs in. Here at Eviliz, we think Anon8252 was giving nothing more than the regurgitation of a combination of long told rumors. There's not a single thing that he/she said that is new information. MDA is interesting but this was a drug that was not even really on the market yet but still in the pharmaceutical stages in Canada - not being smuggled from London. Sorry Anon8252, we're calling BS on you. Thanks to Tayyarrah for the documents. Anybody live near Spahn and want to make a few bucks? On this excellent site a photo was published of what appears to be a Covair. Bruce Davis reportedly was seen driving a Covair. 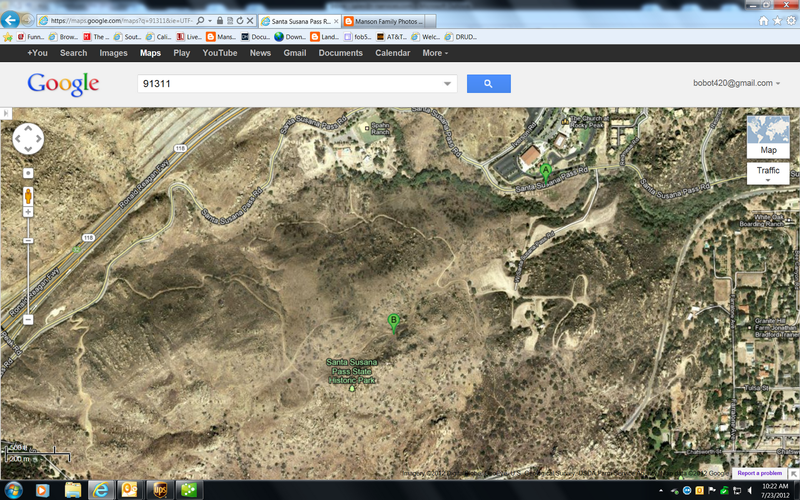 It is above the old Spahn ranch site. How they got it there is a mystery. I would like to pay someone to go and get the vin number. Hey there liz. I love your blog by the way. Here is a map to the exact location of the Corvair car(B). It so friggin hot I wont be hiking there anytime soon. But I will leave you with this info in case someone else wants to swet it out. If you go to google to this location and zoom in all the way, you will see the car. I don’t know how it got there. Perhaps rolled it from the top. Also is there a way I can get pointed in the right direction to Squeaky’s water hole?? Any help would be appreciative, Mike and I want to go film it.